It finds that attention inequality on the web is increasing, is bigger for web browsing compared to searching, and seems to be amplified by increasing commercialization of the web. Attention is omnipresent topic in social media eco-system that draws socio-technological, psychological factors. 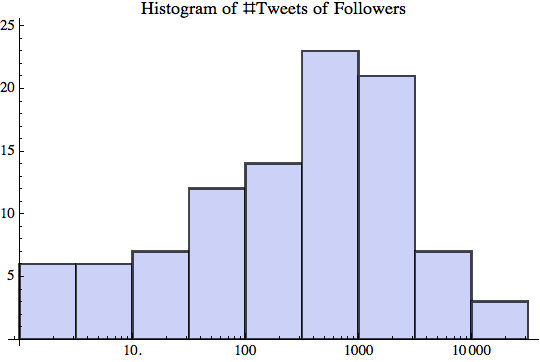 Nice quantitative representation of inequality on Twitter, what program/software did you use for data analysis? Thanks. 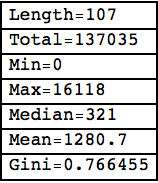 I am doing almost all analysis and graphs on my Blog in Mathematica 8 on a Mac. For the Twitter analysis I am obtaining data directly from the Twitter APIs using various Java libraries. This was a bit more complicated than I thought at first since Twitter has recently changed the authentication model from Basic to OAuth and there were no available Mathematica packages for that yet. I commented on how to get the data from Twitter on a LinkedIn group and can give more details if you’re interested. Fascinating. As a non specialist, or lay person some issues of translation, but this is very good stuff, well done! 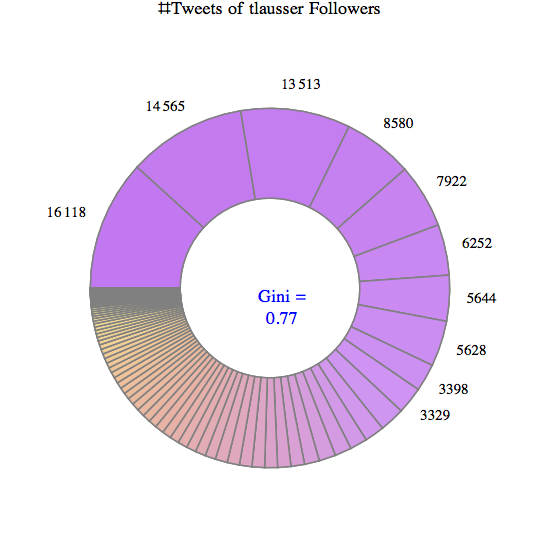 Another interesting data point is for my VisualignCorp Twitter account. 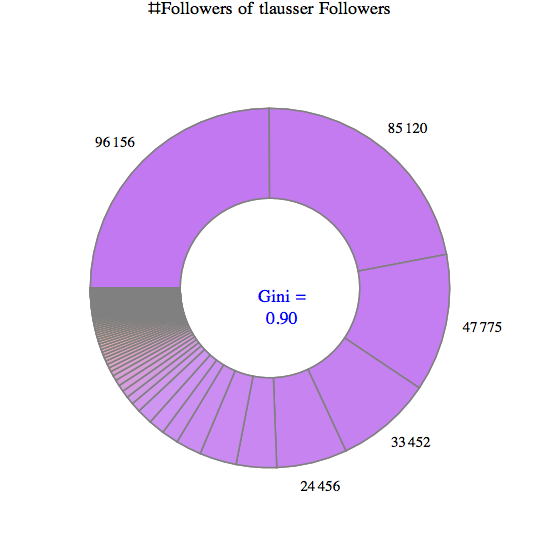 It has a paltry 20 followers, and the sum total of all their followers is about 17,000. 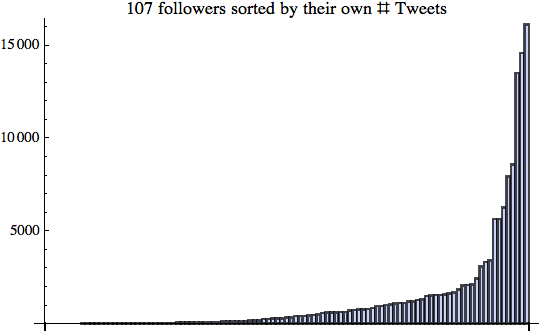 Yesterday my tweet about this Blog Post “Inequality on Twitter” was re-tweeted by a Twitter user with ~318,000 followers! Over the course of the last 12 hours there were a few additional retweets which brought the number of followers reached to about 400,000 – more than 20x bigger than if all my own followers had retweeted to all their followers. I expected the number of Blog visits to this post to spike. However, I only received 8 hits coming from Twitter. 8 (eight)! Out of 400,000. That’s only about 1 in 50,000. 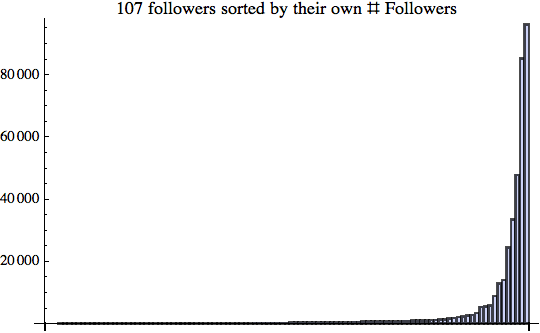 Goes to show that raw numbers of followers may not really lead to high engagement. 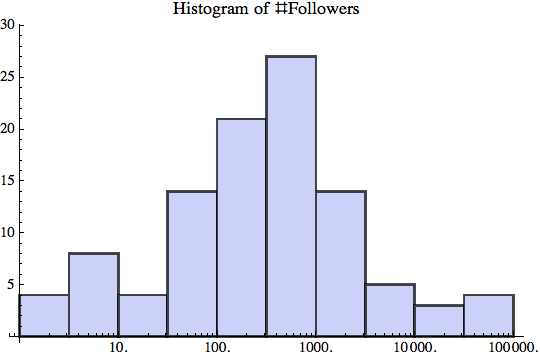 And as we know from the half-life analysis (see https://visualign.wordpress.com/2011/09/09/bit-ly-link-analysis-on-half-life-of-web-content/) we can expect to see about half of all follows of Twitter links in 3 hours, so there won’t be many more coming in. Most of my Blog visits come form search engines (mostly Google in various countries and a few others), and those from image search outnumber regular search by about 4 to 1. Wow – this is a bit more scientific than my own musings on the topic!